The Ephemeroptera Recording Scheme was established in collaboration with the Biological Records Centre at Monks Wood in 2000, to encourage interest in, and the recording of, the 51 Ephemeroptera species found in the British Isles. Records are used to examine the distribution, and current status, of mayfly species. To date over 210,000 records of mayfly species have been collated, the majority sourced from the Environment Agency and the Centre for Ecology and Hydrology, with additional datasets from the Scottish Environment Protection Agency (North and West regions). 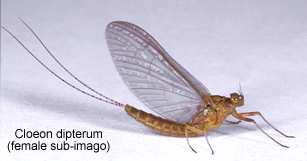 The Ephemeroptera Recording Scheme website, www.ephemeroptera.org.uk, includes: species accounts, distributions and online up to date identification keys. You can also record observations online. Heptagenia longicauda. Recorded on only 4 occasions from the British Isles, this species may now be extinct. Action: A series of surveys is underway to establish if this species is surviving overlooked in suitable watercourses around previously recorded locations. Additional information is available to assist recorders with the separation of Heptagenia longicauda and Heptagenia sulphurea. Facilitating interest in the group. Action:’A pictorial guide to the British Ephemeroptera’, by Craig Macadam and Cyril Bennett, is now in Test Version with the Field Studies Council. Founding member of the Riverfly Partnership – a network of organisations working together to further the understanding and conservation of riverfly populations. The Riverfly Partnership initiative, ‘River invertebrate monitoring for anglers’, enables registered groups to monitor the water quality of their local rivers. Ephemeroptera is recorded as a key group in the monitoring. Flight Periods: Climate change may be affecting the flight periods of British mayflies, however adults of the group are currently under-recorded. Action: Encourage the study of adult Ephemeroptera and record and analyse samples from bankside collections and Malaise traps. Light trap monitoring: It is thought that some of the rarest mayflies may be under-recorded as they are active during the night. Action: Encourage moth trappers to record adult mayflies and to send records (or specimens) to the recording scheme.